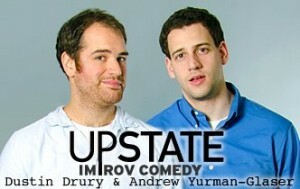 Performing: Saturday, June 9th, 6:00 p.m.
Dustin and Andrew were both born in upstate New York, where life is relaxed and Subways are full of sandwiches. Five years ago they moved to NYC to find life is faster, and subways are full of homeless people. Like their life stories, their improv starts off slow and relaxed and builds to a fast paced mosaic of characters and relationships. Sometimes their worlds collide and sandwiches eat the homeless.